This 70 foot high mural can no longer been seen on the west side of a building in the 9-hundred block of Chestnut Street in Philadelphia. It was created by the Philadelphia Mural Project in six weeks at a cost of $45-thousand dollars in order to be finished in time for the Republican National Convention in Philadelphia in July of 2000. 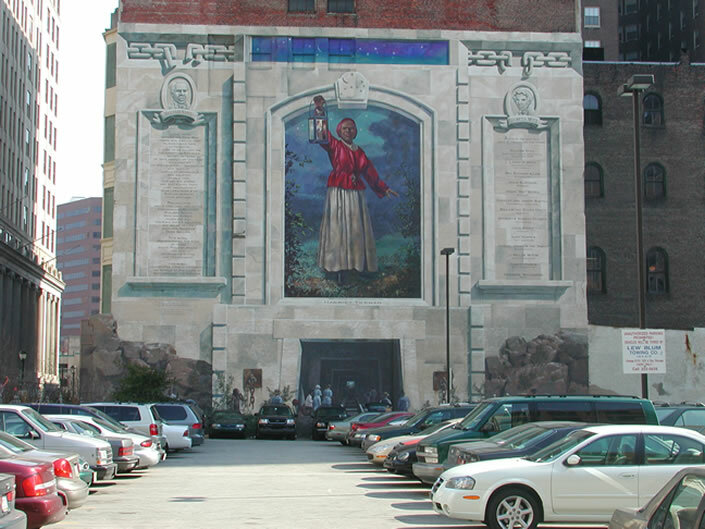 The inscription on the mural contains the names of Philadelphians who played important roles in the underground railroad.The building it was painted on was torn down in June of 2002 to make way for an expansion of the parking lot. A spokesman for the city of Philadelphia said the decision was made due to the economic benefits of the additional parking. No wall mural is a permanent piece of art. The average life of a wall mural is 20 to 25 years. 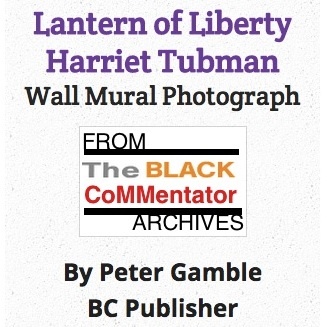 Harriet Tubman's Lantern of Liberty lasted 23 months. BlackCommentator.com Publisher and Chief Technical Officer Peter Gamble, is the recipient of a national Sigma Delta Chi award for public service in journalism and numerous other honors for excellence in reporting and investigative reporting. The “beats” he covered as a broadcast journalist ranged from activism in the streets to the State Department and White House. The lure of a personal computer on his desk inspired a career change in 1985 and an immersion into what he saw as the future of communications. The acquisition of computer programming skills made it possible for Peter to achieve an important level of self-reliance in the technology of the 21st century and to develop BlackCommentator.com. Contact Mr. Gamble.